Gorgeous tumbling honey-blonde curls and dark roots, this lace front is the ultimate in natural glamour. The wig itself is heavy and full, and has a realistic hairline as it is part of our premium lace front range. 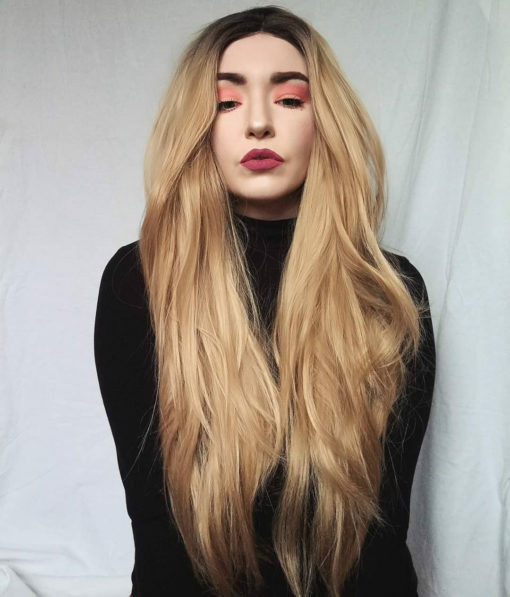 Our most popular premium wig, Blonde heaven is wearable and versatile. 4 out of 5	A whole lot of hair! The colour was amazing and very natural looking. There was alot of hair, so definitely had fullness, abit to heavy for my head. Able to style it in several ways. I love this wig! It looks like real hair but it tangles a lot. I loved this wig and cut it so it was around shoulder length but I’m so disappointed as it has bumps near the hairline which I can’t seem so get rid of, no volume & it doesn’t fit my head properly and seems too small. Had I known this I wouldn’t of purchased it but im sure it’s a lovely wig on someone with a smaller head than mine. This wig is FANTASTIC! Looks super real, first time having a lace front – SO worth it! Was scared to cut the lace: no problem at all. Gave it a chop because it’s very long. The wig/wig cap is VERY big. Even on the tightest setting the wig is way too loose and big for my head. So it bulges out/bends weird. But it is so gorgeous, I don’t even care. 5 out of 5	Gorgeous!! And now I can’t stop wearing it!!! 5 out of 5	10/10 YASS! As the title says: it’s a blonde HEAVEN! I got a lot of compliments asking if this is my real hair (and of course it is). The roots and my hair match perfectly for a natural look 😉 after all… I recommend this wig, because it’s to DIE for! I bought Blonde Heaven recently, and I loved it! It was my first lace front wig, and it’s awesome. The quality is amazing. You need to style it a bit before wearing it in order to make it look realistic, but it’s worth the time. The only “bad”thing is that the wig has too much volume on the top of the head. I think it’s normal for a wig, but it’s easy to hide with a cap. 3 out of 5	100% Slay All Day. The only issues I had with this wig was the patch of very short spiky hairs sticking up on top of the wig and one of the plastic hooks (not clips) inside wasn’t sewn on properly (which I fixed). I didn’t notice the hairs until I tried it on and as far as im aware, returns can’t be made once a wig has been worn, besides.. I need it for my birthday this weekend so I wouldn’t have had time to return anyway. I DO love her though, and I will wear her… and I will 100% slay! 4 out of 5	Beyond Gorgeous Wig!! This wig is gorgeous. Very flattering shade of blonde, with very natural roots. Super long and thick without an unnatural shine. I felt so amazing and happy when wearing this wig. Only downside is it hurts so bad to wear for longer than 30 minutes, even after pain killers. If it didn’t hurt I’d wear this wig everyday. 1 out of 5	Did i get a different wig? Hi Kathleen, sorry to hear you are unhappy. We have no record of you contacting us. We are always super helpful. You may have had a defect as this particular wig always has compliments on its natural look. Get in touch. 5 out of 5	F*cking Beautiful and Glamorous! This wig is amazing. Definitely my favorite wig I’ve ever purchased. The lace front is amazing, and changing the part was decently easy and still looks natural. It does tangle a bit when brushing but this wig is very comfortable to wear. Love love love this wig- really natural looking and feels great too! Very soft, unlike most wigs it doesn’t give me a headache after wearing it for long. This was my first lace front and part of the reason I chose it is because my natural color is nearly black. The roots mesh with my natural hair very well, which makes it look a bit more realistic. I still wear hats for extended wear though, as it doesn’t hold up to real scrutiny. It’s extremely long but comes styled in curls which I feel are easier to maintain than straight wigs. I’ve got more than a dozen wigs from Lush and this is by far my favorite natural one! This wig was part of my first order and I gotta say: the moment I put it on my head, I fell in love. The hair is pretty long and amazingly lush. The lace is visible, but makes the wig clearly more convincing compared to full caps. Using concealer will fix this pretty well. I will definitely buy more wigs from Lush in the future! This wig looks most like my natural hair before it fell out from chemo. It looks amazing and love the lace front. I have had my hairdresser cut it a few inches as it was too long for my liking. Absolutely love this wig! It’s my first lace front wig and amazing quality for the price. Already had so many compliments wearing it and people believe it is real, absolutely gorgeous!! This wig is definitely a must have! It’s my first wig purchase ever and I already know I will be getting more! So in love with this wig!! !